What is it that makes some quite simple pieces of music achingly beautiful, and others just trite? It’s an interesting question, and one that has no easy answer. However, Graeme Koehne’s The Selfish Giant can be placed in the simple, yet achingly beautiful category. Although Koehne is probably best known for the orchestral work Powerhouse (1993), he has also established a reputation as Australia’s foremost composer for ballet. 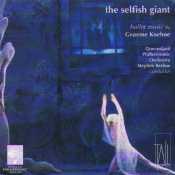 In 1983 he was commissioned by Graeme Murphy to compose the score for the Sydney Dance Company’s new production of The Selfish Giant, based on the classic fairy tale by Oscar Wilde. The ballets success led to a continuing association with the Sydney Dance Company, as well as commissions from the Australian Ballet, the Queensland Ballet (including Once Around the Sun, also on this disc) and the Western Australian Ballet. Koehne is an interesting figure. By his own admission (in biographical details supplied by the composer in 2001), after some early experimentation with the avant-garde, he rebelled against "modernist" and "neo-modernist" trends in music, choosing instead to work towards a personal style that is simple, elegant and yet very rich. His aim is not to write music which belongs to a bygone era, but to take the methods of traditional composition and fuse them together with the musical language and popular culture of today. Both works on this disc show the rewards of Koehne’s efforts. You may find that Scene 8 from The Selfish Giant sounds familiar - it is reminiscent or Satie’s Gymnopedies, and seems to get a lot of airplay on the ABC. But there are many other undiscovered treasures to be found. Put this CD on (better still. buy yourself a copy of Oscar Wilde’s fairy tales to read as well), and within half an hour the world will be a much calmer place. Graeme Murphy’s Sydney Dance Company has the sort of record in commissioning new music for theatrical purposes that ought to be a norm for such an enterprise but, in fact, is rarely matched in its consistent aim and successful outcomes. This Tall Poppies compilation of musical excerpts from some of Murphy’s ballets begins with the tango from Carl Vine’s score for Poppy (1978), a milestone in Murphy’s career and a collaboration that helped to discover for a wide public Vine’s exceptional gifts in writing for dance. Vine’s first piano sonata, also used as a dance score (1992), is played by Michael Kieran Harvey with a matchless sense of identification and is a piece likely to persuade many listeners that this is music they want to live with and, indeed, can’t do without. In scale and substance this is the central experience of the disc. Graeme Koehne’s eclectic facility makes itself felt agreeably in music with a kinship to Vaughan Williams’s Pastoral Symphony in the garden scene from The Selfish Giant (1983) and, in contrast, in waltz and blues idioms in three pieces from Nearly Beloved (1986). Australia’s centre, coast and cities are represented in excerpts from Barry Conyngham’s big orchestral score, Vast (1988), an ambitious and tensely uttered attempt to provide a panoramic sense of the size and range of the country for our bicentennial celebrations. Three excerpts from Martin Armiger’s Fornicon (1995) develop insistent patterns, bucking rhythms and strong climaxes. Iva Davies collaborates with Robert Kretschmer in a song excerpt from Boxes (1985) and with Max Lambert in two evocative pieces from Berlin (1995), in each case demonstrating an instinct for theatrical expansiveness.